Imagine what would happen if each staff member in your company had more consistent follow-though and productivity. How many more clients would you attract and retain? How many thousands of dollars would your firm earn in additional revenues as a result? How would your own life be better, knowing that your staff is doing what they should be doing, when they should be doing it? Did you know that the majority of buyers indicate they’d rather go to the dentist than be on the receiving end of a sales pitch? These same buyers have also said they enjoy the buying process, especially when it improves their circumstances at work or home, just not the selling that goes along with it. Learn about The Avoidant Economy and why this is the greatest opportunity for growth and profitability the staffing and recruiting industry has had in the past 30 years. The chapters that follow give you the best practices, changes, and improvements you’ll need to leverage this chance of a lifetime. The introduction and first chapter are free. Are you tired of the disrespect and poor treatment of salespeople? Would you like to be seen differently by buyers? Are you ready to stand out from your competitors? 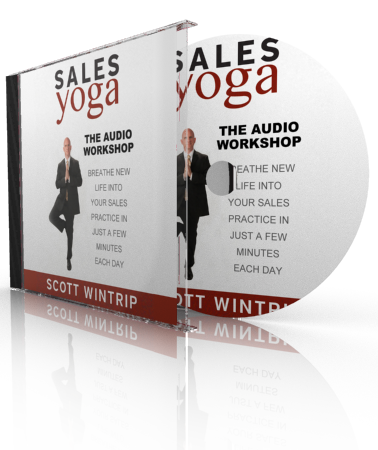 If so, then Sales Yoga – The Audio Workshop, is for you. In just a few minutes each day, you’ll learn how to transform your sales practice using life-changing strategies based upon the powerful and timeless principles of yoga. Consistently doing the next right thing is a requirement for success in staffing and recruitment. That’s why I created these downloadable tools―to ensure that people can keep important processes, steps, and questions right in front of them. Each digital tool has been designed to be as comprehensive as possible while remaining flexible for the varying needs of different companies. Please use this item as a quick way to pay for my services. Click on the “Quick Pay” button below. Enter 10,000 where it says “Enter an Amount”. Fill out the form. In the Comment section, enter your invoice number or a note specifying how the payment should be applied.